This cabin has one bedroom with a fully equipped kitchen. It has satellite TV/VCR & Phone. 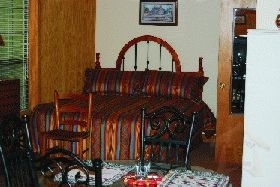 This cabin is also equipped with WI-FI One full bathroom with all linens provided. Heat/Air conditioning and also gas logs. One queen bed plus futon - sleeps four. Enjoy the rocking chairs on the front porch. This cabin is economically priced at $85 per night.